With the controversy, struggles and delays surrounding high-profile light-sport amphibian manufacturer ICON Aircraft, it’s instructive to point out that ICON isn’t the only game in town. There are several cool LSA seaplanes (among other options) on the market, or soon to be there, that are worth a closer look. Boasting two engines and a lot more weight than LSA regs allow, the Lockwood AirCam is a lot of sport plane, and, as an amateur-built experimental, you have to build it yourself. The model’s easy flying manners, multi-engine safety and unsurpassed visibility could make the build time worthwhile. Twelve years have passed since the FAA birthed aviation’s newest segment, and today most pilots know about Light-Sport Aircraft. Perhaps you’ve sampled one or two. Fewer know about LSA seaplanes as a sub-genre, and that’s a shame, because this niche has created some of the most interesting of all Light-Sport Aircraft. The required LSA specifications are almost identical to their land-bound siblings, but a couple of differences distinguish them. First, they’re allowed extra gross weight to account for the boat hull (or floats) and landing gear mechanisms: They have a max weight of 1,430 pounds, compared to 1,320 for landplanes. Secondly, they can have what the agency once called “repositionable” gear, a term invented, as wheel-only LSA may not be retractable. 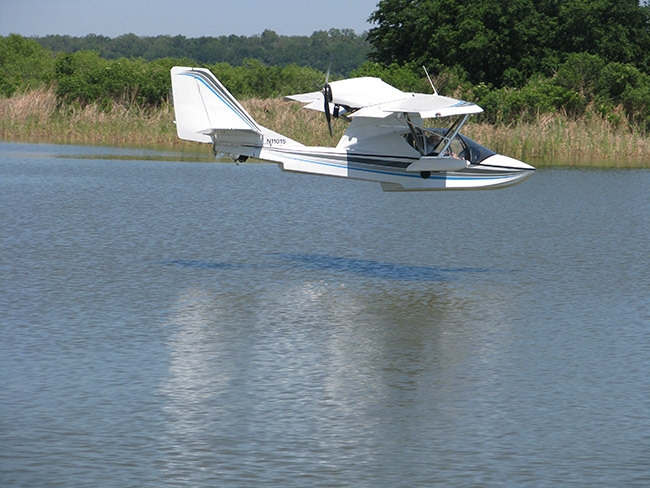 LSA seaplanes otherwise must fit the parameters established by FAA regs unless special exemptions are issued. The result, as you’ll read here, is a cool variety of seaplanes that deliver a lot for the money, with each one doing it in their own impressive style. While the new genre has a growing number of handsome-looking candidates, one brand stands head and shoulders above them all because it has a long track record and a loyal group of owners that any company would love to claim. This is SeaRey from Central Florida-based Progressive Aerodyne. 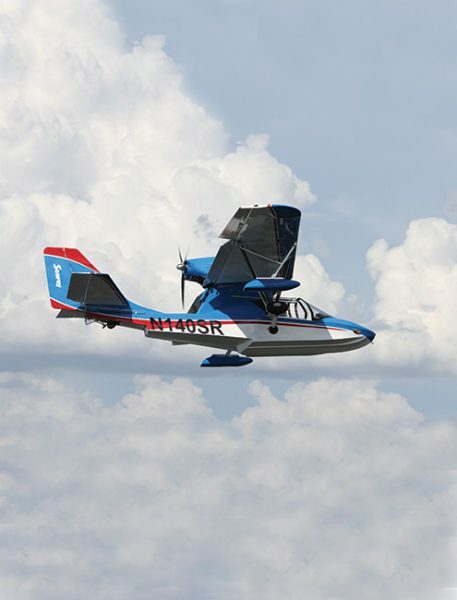 Affordable to buy and to fly, the mild-mannered Progressive Aerodyne SeaRey has been a popular sport amphibian choice for decades. More than 600 SeaReys are flying, most built as kits before the fully manufactured LSA category was created. However, the company has since been steadily delivering ready-to-fly Special LSA, and they have done quite well following a successful compliance audit by the FAA. Not only is this true in America, but Progressive Aerodyne has sold airplanes to other countries that embrace the ASTM industry consensus standards. One such nation is China, where SeaRey may be the most successful LSA by sales. Progressive Aerodyne is one of the original suppliers of light, sporting aircraft, dating back more than 20 years, long before the emergence of aviation’s newest segment. That gives this company experience not only in the production of light aircraft, but through serving American consumers. The SeaRey series is arguably the most loved of all light seaplanes in America with a tightly linked community of owners. Those who have built their own SeaRey kits are unusually willing to help one another. After completion, they enjoy flying and socializing together in a way other brands can only hope to foster. Ask a SeaRey pilot yourself, and you’ll quickly get the message: These owners clearly enjoy their watercraft. SeaRey pilots are a passionate group, who brag about the flying qualities and depend on the well-proven nature of this veteran design, which has evolved continuously from its two-stroke engine days to the modern FAA-accepted version powered by the 100-horsepower four-stroke Rotax 912 or 115-horsepower turbo 914. Another time-tested LSA seaplane is Super Petrel LS, manufactured by Scoda Aeronautica in Brazil. The company recently established a U.S. operation in Ormond Beach, Florida. 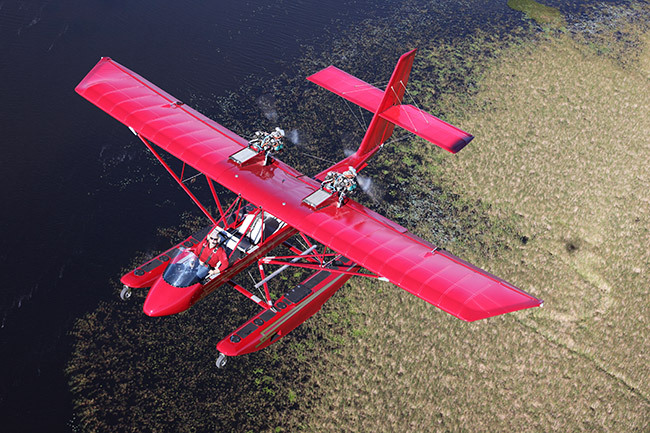 This biplane flying boat has been flying for more than 20 years. Think the biplane Super Petrel looks old-fashioned? It’s not. The all-composite seaplane is one of the most technologically advanced LSAs, period. The answer is that two wings offer an abundance of square area without creating a wide span, making it easier to beach. More wing area lifts you out of the water faster, a goal of every waterbird. The two wings attach to a modern composite boat hull and fuselage. The Super Petrel LS boasts quality handling on land or in the water. The design is straightforward to fly with cooperative flight controls, making it good for owners with less experience. 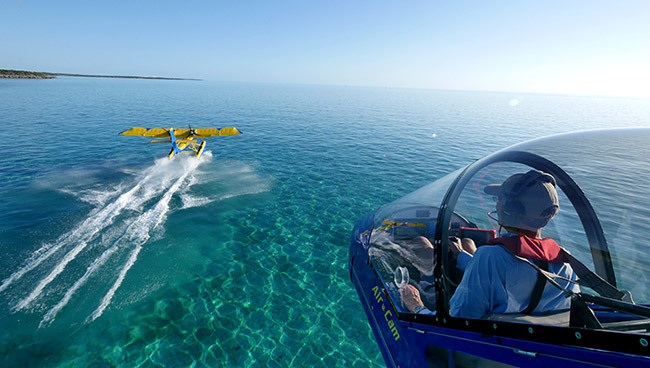 It can take off or land in less than 400 feet, an impressive feat for any seaplane. The Super Petrel’s well-regarded maintenance program combines with quality construction to produce a solid safety record. The FAA traveled to Brazil and audited the company’s design and its manufacturing system, and reviewed all its manuals in the agency’s typically thorough evaluation. After poring over Scoda’s documentation, the FAA accepted Super Petrel as a Special LSA. The airplane offers a spacious cockpit with a nicely upholstered interior. It can carry two luggage bags of approximately 50 pounds total. The Super Petrel’s 100 horsepower Rotax 912ULS and the new fuel-injected 912iS Sport offer low fuel burn and reduced noise, so operating on a lake surrounded by homeowners should generate fewer complaints. The Super Petrel performs with a climb rate of 1,000 fpm, a cruise speed of 100 knots and a useful load of better than 550 pounds. Before fuel and occupants, the Super Petrel LS is just 770 pounds, low for an amphibious seaplane. Aero Adventure offers possibly the lowest-cost boat-hull seaplane in the light aircraft space with a kit that, complete with engine, sells for less than $50,000, and, yes, you read that right. Add a long history to its credit, and the Aventura appears to be a seaplane worthy of a close look. This owner-assembled model isn’t available as a fully manufactured Special LSA. Available as a kit in versions as cheap as around $50,000, the Aero Adventure Aventura is a popular choice for budget-minded seaplane shoppers. The little Light Sport flying boat features conventional sailcloth and tubing ultralight construction, yet has a reputation for holding up well against the waves. Seaplanes offer capabilities beyond those of landplanes, so that typically makes them comparatively expensive, even in the light aircraft sector. Is a $49,000 price tag merely a come-on to grab your attention? What is Aventura II’s true cost when a typical owner completes the building job? We asked, and they answered: $55,000 to $56,000. That’s an excellent value for a fun airplane with a history in the decades. Like many companies, Aero Adventure has been around long enough to have different owners, but today it’s led by young Alex Rolinski. The present company tallies 200 Aventura models built, but that doesn’t include earlier models. Asked to estimate all the airplanes of this type, back to the original Buccaneer, and the number grows to about 1,000 aircraft, a solid fleet size that shows the appeal of this proven design. Because Aventura is a kit—there’s no completed S-LSA option—it can be offered in a wide variety of configurations and personalized even further by the owner/builder. You can choose from a selection of engines. Aero Adventure likes to work with AeroMomentum, offering the 117-horsepower Suzuki conversion, based on a brand-new engine block with customized aircraft components. Aero Adventure also offers the handsome Viking engine, as well as the light aircraft industry’s most popular engine, the Rotax 912. 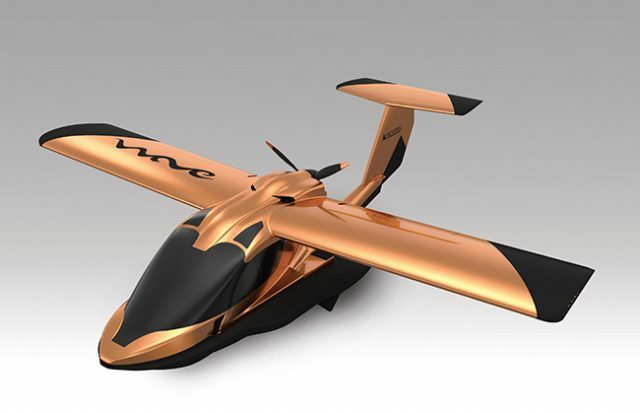 MVP.Aero turned many heads when first exhibiting its one-of-a-kind entry to Light-Sport Aircraft seaplanes. MVP, for Most Versatile Plane, justifies its namesake by doing more than flying off water. 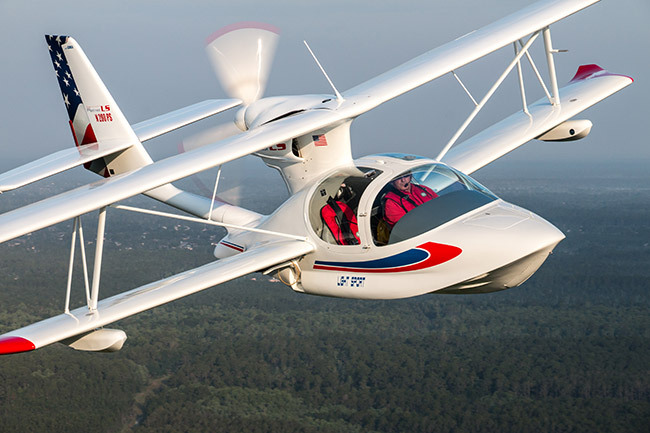 The creators of MVP have so much in mind for this Light-Sport Aircraft that it takes a while to fully grasp the purpose, that of being a truly useful airplane. MVP doesn’t merely fly you to your lake destination; it cares for you after you arrive. You can even sleep onboard. Intrigued? The emerging MVP looks to marry the missions of flying and boating. Toward that end, the pilot can fold the wings while on the water, greatly easing docking. Some of what makes MVP unique are retracting components. Of course, its wheels get out of the way for water landings, but the canopy also retracts manually using a clever mechanically leveraged control. The canopy opens in front of the pusher engine, but does so in such a way that it doesn’t block engine operation or prop spinning. As a pilot taxies to a dock or prepares to beach, MVP offers wide-open visibility with the canopy completely out of his or her way, yet the pilot can continue to operate the engine to guide the aircraft. Likewise, the instrument panel also can be retracted out of harm’s way; water splashes by thoughtless boaters or weather-generated waves aren’t kind to electronic instruments. The retracting instrument panel does double-duty by giving more access to the MVP’s foldout front deck area. MVP is made to fly and move well on water or land; you’d expect that. What will further delight you is how you can keep on using MVP after you’re done flying, docking or beaching. To become a fishing boat, the pilot retracts both canopy and instrumental panel and moves his seat off a front deck pedestal after deploying the stowed “origami” deck elements to make a broad, flat surface. Fishing from the relocated pilot’s seat is easy and comfortable. A companion can relax in the hammock on the aft of MVP, accessing the hammock by walking along the sponson areas without worrying about upsetting the craft. It’s designed to be stable on the water while moving around the craft. Importantly, the pilot can stow the wings while still in the water, allowing the plane to be docked very easily or even stored inside cozy boathouses. Vickers Aircraft has created one of the most distinctive new LSA seaplanes yet. It has yet to fly, but the company claims it has all the necessary financial backing and is presently building what CEO Paul Vickers says are production parts. A proof-of-concept aircraft won’t be built. 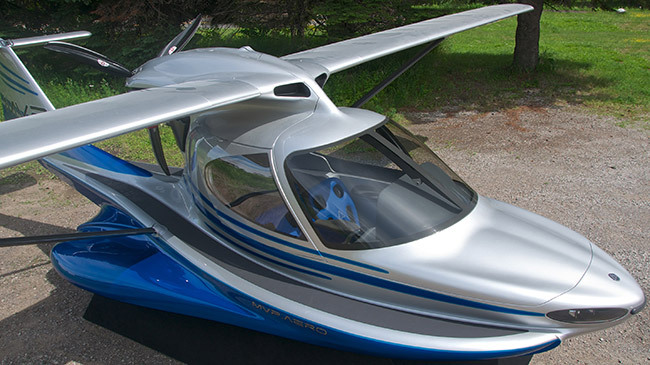 This isn’t the usual way, but it could leapfrog the Wave ahead of other deluxe LSA seaplanes. If they can get to market soon and with the very reasonable price that Paul has forecast, the Wave could find ready buyers. Built to a significant degree from carbon fiber—fuselage, wing surfaces, tailplane, hull—with an aluminum wing structure, the Vickers Aircraft Wave exhibits a very dashing and modern look. Many attributes are unique to this design. Another emerging model and arguably the most intriguing is the Vickers Wave, a seaplane with 180 hp, enough oomph to get off the water in a hurry. A longtime boat hull designer, Vickers is bringing a different approach to the creation of the Wave. Paul has produced more than 100 boat-hull designs and now pairs aeronautical skills to years of intensive engineering using the latest software. 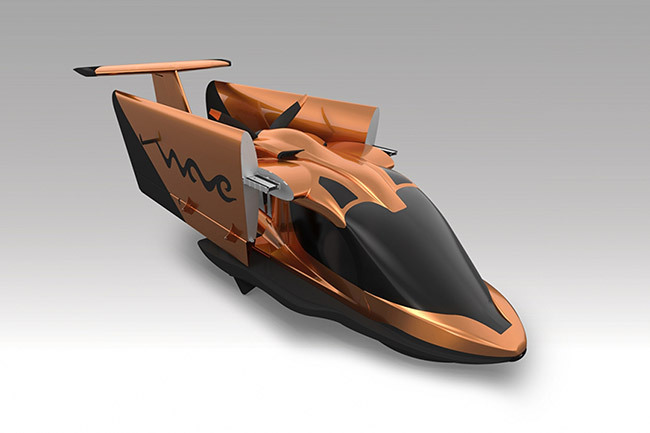 The Wave has been engineered with a focus on production, helping to assure they can make weight while offering much greater power than any competitive amphib. Vickers has selected the 180-horsepower Titan X-340 by Continental Motors. Although this powerplant is gaining increasing acceptance in the LSA space, it has one penalty: weight. Is the extra 110-pound allowance enough? Vickers maintains he can make weight with the big engine. He credits Titan with reducing pounds in several ways. If we go beyond boat-hulled aircraft, we open the door to nearly countless models, and space doesn’t permit mention of all of them, with due regrets to designers of those aircraft. One more aircraft is hard to overlook, however. For something completely different, how about a twin-engine, open-cockpit, cloth-covered amphibian? The AirCam is one of those airplanes people talk about long after a demo flight. A pair of AirCams plays in the water just off the Florida coast. AirCam designer and company president Phil Lockwood is at the controls of the blue one in the foreground. We don’t know how the photo was taken though—we suspect the back-seater had long arms. Lockwood Aircraft is the producer of an airplane purpose-built for flying in difficult conditions, specifically flying low over dense African jungle forests that stretch beyond the horizon with no place to land. With two 100-horsepower Rotax 912 engines, the 1,680-pound AirCam has power to climb fantastically or to continue climbing effortlessly, albeit somewhat slower, with a single engine. Pusher powerplants are located close enough together that asymmetric thrust is barely noticeable. With tandem seating—some have been built with three seats in a longitudinal row—the front-seat pilot has a view almost unparalleled in all of aviation. The aircraft is named the AirCam because a photographer sitting in the forward seat has nearly no obstructions to his purpose. When not filming, the AirCam offers a first-class seat to a recreational pilot. I earned my multi-engine rating in an AirCam and readily admit this is almost cheating, so easy is the AirCam to operate even if one engine is misbehaving. Its capabilities and the flying qualities have attracted a loyal following of 200 owners. The design is so effective, it can taxi and take off with one engine, a rare feat among piston twins. Shutting down one engine in flight barely changes the flight characteristics. If, like many pilots, you enjoy going aloft for the view, the AirCam delivers an experience that’s about as good as it gets. Flying low over terrain you’d never consider in another aircraft, crossing bodies of water (or forests in Africa) and the confidence to see America from an altitude that lets you take it all in are a few reasons to think AirCam. As a twin-engine aircraft, the AirCam can’t be a Light-Sport even if it feels like one. You build an Experimental amateur-built from a kit, though finished used aircraft are sometimes available. Lockwood helps new builders by offering a Super Quick Build kit and backing that with some of the light aircraft industry’s finest technical support. 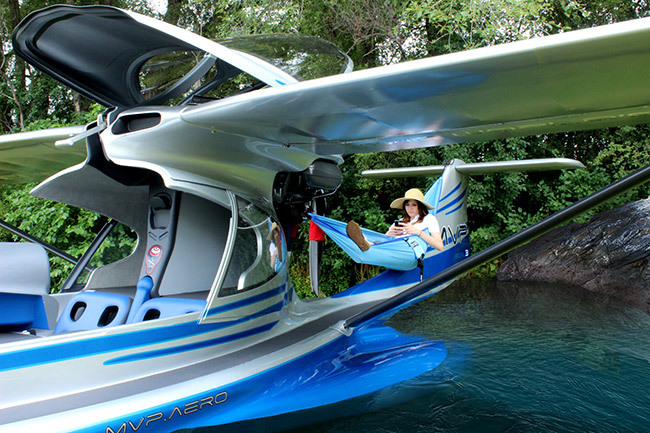 Just add floats—made by various producers of float systems alone—and you can add many more LSA landplanes to the list. 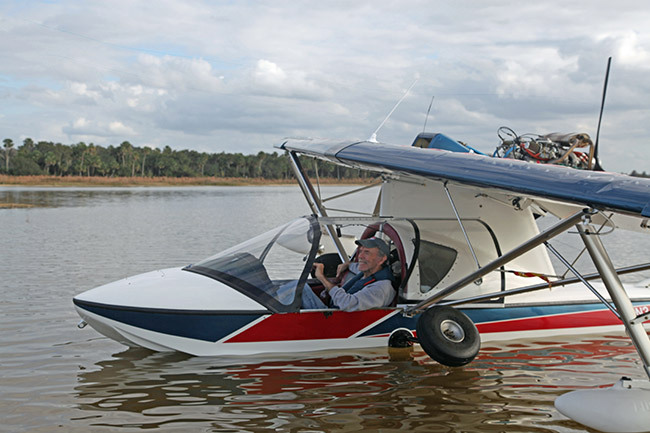 These aren’t limited to fixed-wing, three-axis aircraft, but include weight-shift (trike) aircraft, Part 103 ultralight vehicles (even including a float-equipped ultralight helicopter) and more. An entire Plane & Pilot dedicated to this niche within a segment could fill an issue of the magazine and still not cover them all. It’s great to have choice, and merely within the LSA segment, pilots are presented with a large array of seaplane purchase opportunities. We’ve shown a few to wet your water-flying appetite. Dan Johnson is a 6,000-hour Commercial, Instrument, Multi-engine Pilot and former Certified Flight Instructor. President of the Light Aircraft Manufacturers Association, he has owned numerous aircraft, with a current focus on Light-Sport Aircraft, light kit aircraft and ultralights. Dan is a longtime reviewer of recreational aircraft, having flown 400 different models. Visit ByDanJohnson.com. Want to read more about LSA planes? Check out our article “LSA Choices Galore” for a look at what this year had to offer LSA pilots. Very interesting article, I have a wonderful time with my aventura 2 in the Caribbean. One great seaplane LSA that sadly is not represented in USA at present (opportunity?). This is in full production and is not ‘future technology’ but available now on 3-4 month delivery and has been since 2006 is the Colyaer Freedom S100. This is now also supplied with the Rotax iS motor as well as the proven 912ULS. They are well reputed International suppliers and a great family company that’s light on International marketing, otherwise there would be more. Fully composite (no fabric wings/empennage) all SS fittings and fastenings incl SS Brakes, no rusty steel gear like the popular Searay and much faster in cruise! We have a few in Australia, one in exotic places like Lord Howe Island, where its used to fly between the island and the ‘big island’ (Aussie mainland) on a regular basis and I have one in Sydney on my waterfront lot, see pix attached, my ramp is immediately behind the aircraft. Hopefully I can manage the technology to attach these pix! You forget the seamax, one of the best light sport anphibs ever.